Yunus Effendi Habibie, the Indonesian ambassador to the Netherlands, caused a bit of a kerfuffle recently when he indicated that voters who preferred Geert Wilders’ party might in fact be psychotic. He and the government he represents have taken offense in the last few months over the less than complimentary things Mr. Wilders has said about Islam. The PVV responded by demanding that the Foreign Ministry have a little talk with the ambassador to set him straight. Since the proposed new government is dependent on the support of the PVV in its formation, the ministry complied surprisingly quickly with Mr. Wilders’ demand. Indonesian President Susilo Bambang Yudhoyono will pay a state visit to the Netherlands from October 6 to 9, 2010. “Relations are super-smooth, but the circumstances are not that pretty,” the Indonesian ambassador Yunus Effendi Habibie [brother of former President of Indonesia (1998-99) Bacharuddin Jusuf Habibie] said. Would the possible support of the PVV for a new cabinet stand in the way of a visit by the Indonesian President? “The president had already promised to visit the Netherlands, before it was clear what [coalition] government was being formed. He is ‘a man a man, a word a word’. But the circumstances are not that nice. If Mr. Wilders had become part of a new government, the upcoming state visit might have been very doubtful. The president of course will not come over when there is someone in the government here [the Netherlands] who calls the Islam backward. I do not want my president to be put down as a clown here. Will the support of the PVV for a Dutch [coalition] government influence the relations with Indonesia? “I see no reason why we cannot cooperate, unless the Dutch Government implements an anti-Islamic policy. If Mr. Wilders remains outside the government, he may shout whatever he wants. As long as he stays barking outside the cabinet. Why would we mess up our relations because of this one man? Incidentally, I observe hate speech in his words. Moreover, my uncle, was repeatedly thrown into jail by the Dutch because of sowing hatred against the Dutch colonizer, but put that to the side. Does the growing influence of the Party for Freedom already have an effect on bilateral relations? What conclusion do you draw from the growing popularity of Geert Wilders and the PVV? Why does the state visit takes place at this time? Will this state visit further improve the ties between Indonesia and the Netherlands? PVV leader Geert Wilders wants the Indonesian ambassador to be “have his ears cropped diplomatically” if he expressed himself in a negative way about the PVV and its electorate on behalf of his own government. “We cannot let this pass,” Wilders said Thursday. Earlier in the day Wilders demanded that Verhagen [outgoing Foreign Minister] act against the ambassador. Verhagen should summon the ambassador and denounce him, following his “offensive statements” in his interview, Wilders said. Questions from members [of Parliament] Wilders and Kortenoeven (both PVV) to the Minister of Foreign Affairs [Verhagen] about the outrageous statements by the Indonesian ambassador concerning PVV leader Geert Wilders and the Dutch electorate that voted for the PVV. 1.) 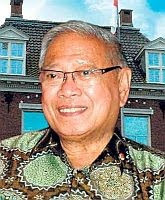 Have you noted the article “Visit from Jakarta despite Wilders’*, in which the Indonesian ambassador to the Netherlands, Yunus Effendi Habibie, makes defamatory statements about the alleged incompetence, the ‘hate sowing’ and ‘shouting’ and ‘barking’ of PVV leader Geert Wilders; and in which he insinuates that the Dutch who voted for the PVV suffer from a “fear psychosis”? 2.) Did the Indonesian ambassador speak on behalf of the Indonesian government? 3.) Do you agree with me that the statements by Habibie are inaccurate and inappropriate? If not, why not? 4.) Are you willing to summon Ambassador Habibie to pass on to him your dissatisfaction with these statements? * See also “Indonesian Ambassador: ‘I do not want my president to be put down as a clown here’”, above. Outgoing Foreign Minister Maxime Verhagen (CDA) wants a talk with the Indonesian Ambassador, Yunus Effendi Habibie. The ambassador said among other things that the people who voted for the PVV live with a fear psychosis. “The ambassador of Indonesia, in a country where freedom of expression is of paramount importance, is free to say what ever he wants,” Verhagen says. But he finds that the descriptions Habibie uses for the PVV electorate are not wise. On Thursday Verhagen will immediately contact the Indonesian representative. THE HAGUE — The Indonesian Ambassador Junus Effendi Habibie has made known in a conversation with a senior official of foreign affairs that he should not have spoken in such terms about the PVV electorate. A spokesperson for the department in The Hague made this known on Thursday. In an interview with Het Financieele Dagblad [see interview above] the ambassador of Indonesia said among other things that “Wilders’ voters may suffer from a fear psychosis.” Habibie realizes that it would been better if he had not spoken in these terms about the PVV electorate, Foreign Affairs said. The senior official replaced outgoing Minister Maxime Verhagen (Foreign Affairs), who is busy with the formation [of a government with the VVD and supported by the PVV]. Verhagen had already stated that he found it “not wise” that the ambassador had expressed himself this way about the electorate of the PVV. The interview aroused the anger of PVV leader Geert Wilders, who insisted that Verhagen must summon the ambassador [and so he did]. The only reason there were medical schools in Baghdad is that the Assyrians were leaders in medicine. Moslems till this day take credit for the Assyrian's achievements whilst actively persecute them for being Christian. I'll tell you who's psychotic. Muslims who migrate in their thousands to the West whilst simultaneously criticising the West in the most appalling langusage, accompanied by appalling terrorist activities. The disconnect and hypocrisy involved are so profound as to be psychopathological. Sounds like another play from the Soviet book on how to invalidate the opposition. So Indonesia, a beggar nation under the flag of Islam, seeks to dictate who can and who cannot be in parliament in Holland? Try to tell the Muslims (just once) that you don't like the headbangers who rule their countries. Would be interesting to see how that peters out! This is blatant interference in the internal affairs of the Netherlands. Under normal circumstances, a sharp note should be handed to the ambassador for his ill-tempered remarks. If Mr. Wilders receives no apology, the minister should be sent packing. These are accepted rules of dimplomacy.